Gene is in his 90’s, barely has a high school degree, yet is wiser than 99% of us. Gene learned through the school of hard knocks and by picking the brains of the successful. His first business venture was owner of a winter gear company. Listening to Gene tell me stories of how he ran that company is like listening to your grandfather tell tales of walking to school in the olden days. I love business and the hours over my life listening to Gene’s stories. He figured out how to build a factory for less than the going rate by incorporating efficiencies he discovered. He bought a restaurant once for fun. To save money, he had his cooks make the biscuits square to not waste dough. After selling his company for a sum that would let anyone retire in style, he decided to build houses for a hobby. That hobby led him to become the largest builder in Maury county; selling a third of the new homes. I remember him telling me that by investing a thousand dollars more in upgraded fixtures, he was able to give his houses a ten thousand dollar higher perceived value. America buys on value; not price. If it was all price, then we would all drive Yugo’s, shop at Wal-Mart, dine at McDonald’s and get our hair done at Super Cuts. 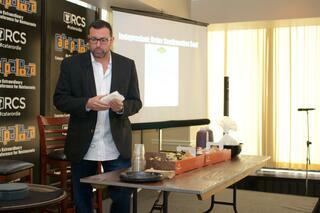 Last week’s article was recap of my mystery shopping presentation at Caterpalooza of three different delis. 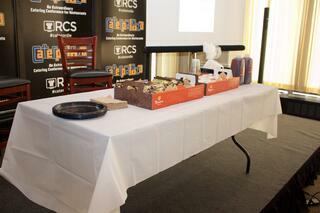 We purposely had each catering order set up on a plain table (see pic below). Aside from the variety of packaging, you will notice each table scape is very bland. Now how can you double the perceived value of your catering for a buck? Though I would love to take credit for this, the hero of this story is Frank D’Antona owner of Cantina Mamma Lucia. Frank was the first guy to use our catering software and has been following me since 2003 with incredible results. I have been to Baltimore twice to do a catering seminar with him. Both times he was generous enough to share how he runs his hugely successful catering profit center. One thing Frank does is brings out a plain white table cloth to put on his client’s table before setting out his food. At my presentation, we took the food off a plain table and added a disposable table cloth that you can buy at the dollar store for a buck. It may cost you two bucks to have it delivered from your vendor. Either way it is a bargain. This is like one of those makeover shows. Another thing Frank does is bring out a plastic bowl for ice when drinks are ordered. It’s a small thing that makes a big difference. Only one of our mystery shopped caterers brought an ice bowl with a spoon. As I write this, in less than twenty-four hours I am headed for Costa Rica to do some R&D and get some much needed R&R from Caterpalooza. I wasn’t sure how our first Caterpalooza: An Extraordinary Catering Conference For Restaurants would do. We more than doubled our goal for attendance. 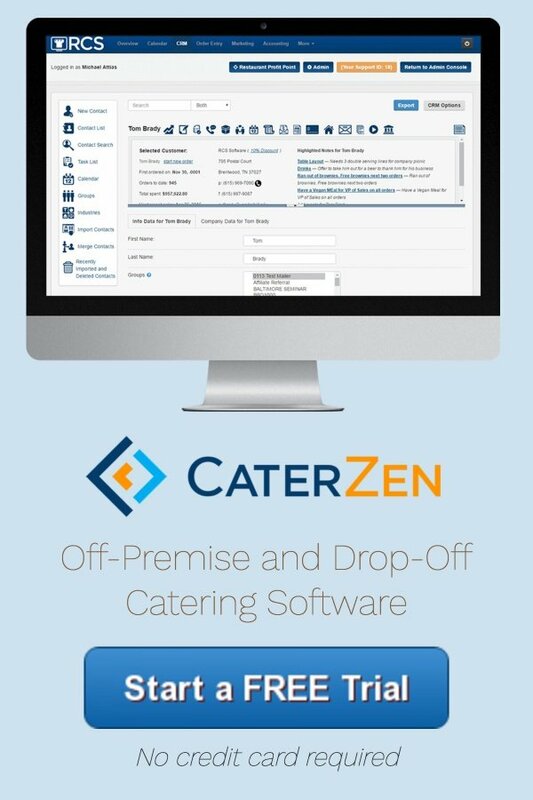 I realized Restaurant Catering Systems is “the home” for restaurants that cater. Restaurant catering represents the largest catering niche, yet has no voice. 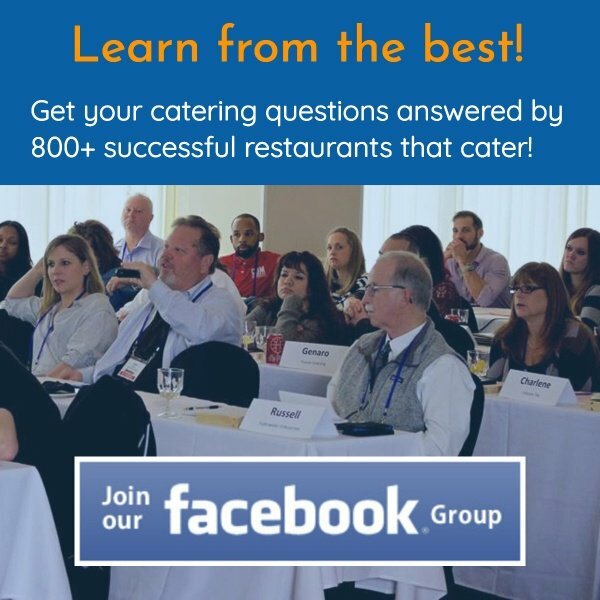 Based on the recommendation of a Caterpalooza attendee and client, I have created a private Facebook group called “Restaurants That Cater”. Please ask to join. I will welcome you. I kept it private to prevent spammers. I know together we can all go further!